Fizzy and spooky or slow and lazy? Whichever of these best describes your horse a review of their diet is a good place to start if you want to try and make riding more pleasurable! 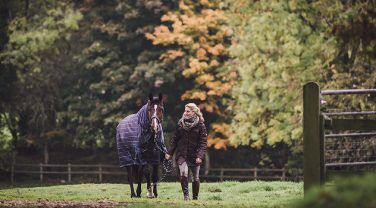 The amount and type of energy you give your horse are both factors that can affect their behaviour. Make sure you’re not over-feeding for the amount of work being done – studies have shown that horse owners tend to over-estimate how hard their horse is working and so the temptation is to feed too much. 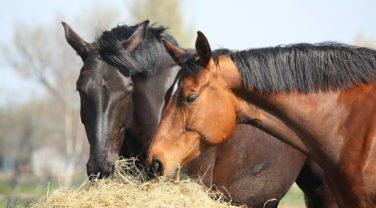 A study supported by Dengie and published in the journal Applied Animal Behaviour Science, showed that horses fed a fibre and oil based diet had lower resting heart rates and were less reactive to novel stimuli compared to horses fed the same amount of energy but from cereals. Ensure the diet is balanced – vitamins and minerals are involved in energy metabolism and are often missing from the diet of good doers as they are frequently on restricted rations. 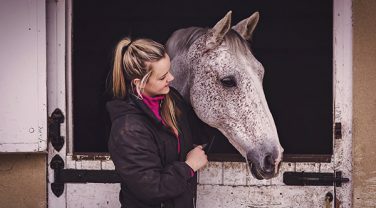 Electrolytes aren’t just for performance horses – if your horse is sweating a lot when working which is often the case for those that are a bit overweight, they will be losing electrolytes which can result in fatigue. Topping up with an electrolyte supplement is recommended. I have a Thoroughbred who is really sharp to ride but is underweight. How can I put weight on without making her behaviour worse? The first step is to help her break down the fibrous part of her diet as efficiently as possible. Using a digestive supplement that contains ingredients such as yeast and prebiotics will help to establish a healthy population of microbes in the gut that the horse relies on to digest fibre. The more energy the horse can obtain from the fibre, the less need there is likely to be to use more concentrated sources of energy such as cereals. The next step is to feed ad lib forage. Ad lib means that your horse always has forage available – so if you turned up at 3am would there still be some hay or haylage in their stable for them to eat? With regard to the bucket feed, select a feed high in fibre and oil as the main source of energy in the ration. 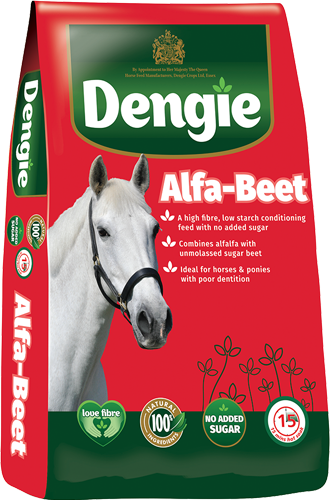 Adding highly digestible fibre sources such as sugar beet (Dengie Alfa-Beet) is also beneficial and studies have shown also helps to improve the digestibility of other fibre sources in the diet. Additional high oil feeds such as micronized linseed can be added to provide more energy and should be used in preference to cereal based feeds. Can I use sugar beet for my fizzy horse? Unmolassed sugar beet contains less than 5% sugar as the sugar has been extracted for use in human foods. Sugar beet pulp is the fibrous part that is left after the sugar has been extracted and is widely used in animal feeds. 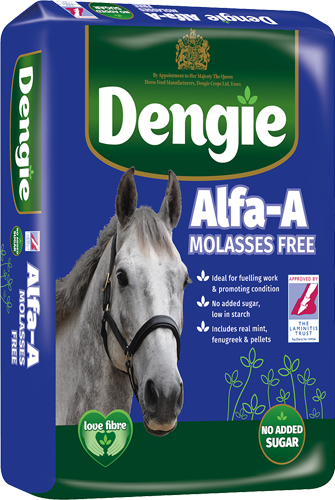 It is a source of highly digestible fibre and so is a great way to add energy to a horse’s ration, particularly those where it is desirable to keep sugar and starch intakes as low as possible. So yes, sugar beet pulp is suitable for a horse prone to over-excitable behaviour. I have a Dales pony who is in regular work and his weight is just right. I compete in dressage and eventing and would love him to have a bit more sparkle. He’s fed a couple of handfuls of high fibre cubes with Hi-Fi Lite – what would you suggest? 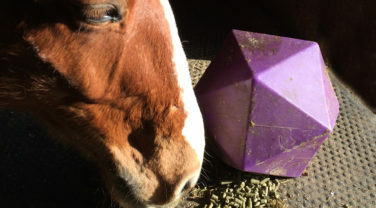 It is common for good doers to be fed less than the recommend amounts of a low energy mix or cube which keeps the energy (calories) down but also means your pony isn’t getting the right levels of vitamins and minerals. The first thing I would suggest is changing the cubes for a low calorie balancer such as Dengie Hi-Fi Balancer. Try this for a few weeks as you may find that just increasing the intake of vitamins and minerals will help. As he is in regular work and isn’t overweight, it is also possible to try adding a few oats to the balancer. Oats contain starch which is a source of quick release energy and so may help to give him a bit more sparkle. You can add a very small amount each day and then increase a little bit the day before a competition to see if it gives him a bit more sparkle when you need it. It is very important to use as little as possible to avoid him putting on weight and by using the balancer you can use as much or as little of the oats as you need to give him the energy you want. If you try them and they have no effect, remove them from the ration as they increase the risk of other problems. We would not recommend using oats if your pony has had laminitis. My horse is lazy and overweight. What can I add to his diet to give him more energy whilst not putting any more weight on? 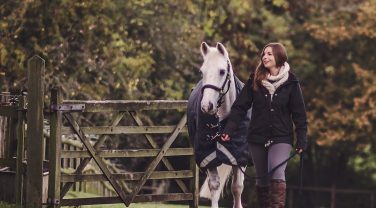 Fundamentally the best thing you can do to improve your horse’s energy level is to encourage weight loss and to increase fitness whilst having variety in the exercise regime. For further advice on encouraging weight loss please click here. Adding more energy to the diet will only serve to worsen the obesity issue and is unlikely to result in a more enthusiastic ride. Whilst we are encouraging weight loss it is important to continue to ensure that the ration is balanced with respect to vitamins and minerals as these are linked to energy metabolism. Using a low calorie feed balancer such as Dengie Leisure Balancer or a broad-spectrum vitamin and mineral supplement such as Leisure Vits & Mins in conjunction with a low calorie fibre feed can help to achieve this. If your horse is regularly getting hot and sweaty we would also suggest the addition of an electrolyte supplement to the ration as dehydration can also affect performance. As the nutritional value of grass decreases, this is the time that horses are most likely to start to lose condition, particularly if they are older or in work. A high fibre diet is the best thing for your horse. 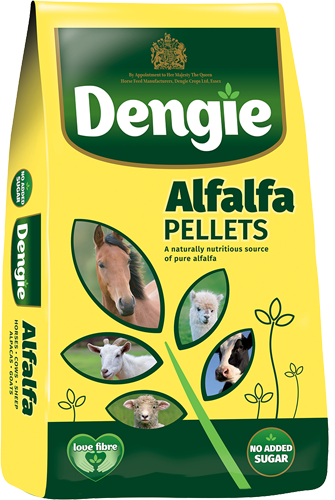 For a trouble-free winter take a look at the range of fibre feeds from Dengie. 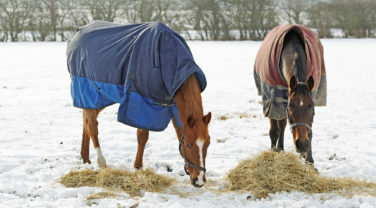 With winter just around the corner now is a good time to review your horse’s ration. Dengie senior nutritionist Katie Williams, MSc (Dist), serves up some dietary advice to keep our horses healthy throughout the winter.